Every now and then, in Quartet singing, four guys who have been singing in other groups for years find their musical paths crossing - and something special happens! The Happiness Emporium was formed in December, 1972, and right away they sounded like a winner. In their first year and a half they won 4 contests and placed in the Top 10 in International Competition. Then, a year later, in June, 1975, the Happiness Emporium was proclaimed the International Champions of Barbershop Quartet singing. The members of the quartet have a combined total of over 150 years of quartet experience. They have sung with 7 District Champion quartets, and have sung for audiences all over the U.S., Canada, England, Sweden, Ireland and the countries of Central America while performing on an educational cruise, Semester at Seas. Two of the members have toured Pacific military hospitals on USO tours with their previous quartets. They have led two tours to Ireland, where the H.E. was the featured quartet of the Irish International Barbershop Convention. The Emporium is a remarkably versatile singing group, equally proficient with "pure" barbershop arrangements, modern harmonies, gospel, show tunes, country, nostalgic medleys and comedy. One reason for the success of the Happiness Emporium is the matched unit sound of four excellent voices. Each of the four was often featured in solo numbers backed up by the other three. They have performed for countless conventions, coast-to-coast barbershop shows, variety shows, radio and TV, the Grand Ole Opry, on New York's Broadway, Kennedy Center and London's Barbican Centre. On October 26, 2013, the Happiness Emporium performed on their "final" barbershop show at the Land O' Lakes District barbershop convention in LaCrosse, Wisconsin. From December, 1972 through October, 2013, it was a fantastic run! Here's to 41 great years! They formed in December of 1972 when three Land O' Lakes quartets, the Hut Four, Gemini Crickets, and Red Barons retired. The Night Howls, a St. Paul quartet, contributed a tall tenor and the fun began! During the 41 years of regular performing on the "circuit", the Happiness Emporium performed on over 400 Barbershop Chapter Shows and 475 non-barbershop shows. They performed in 42 States, six Canadian Provinces, England, Ireland, and Sweden, and even a Federal Prison in Washington State, where the inmates now sing gospel arrangements provided by the quartet. All told, they have spread their brand of happiness in 18 countries on shows, tours and cruises. The Happiness Emporium produced seven Barbershop albums, four Gospel albums, a DVD, and one-half of a Society album with the 1976 International Champs, The Innsiders. The H.E. also produced four Gospel learning albums as the Good News Quartet, while leading the Good News ministry from years 2000 through 2014. Three members (Bob Dowma, Rod Johnson and Jim Foy) are the original members; and our third baritone (Rick Anderson) is still singing with the quartet. 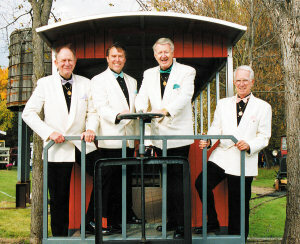 The quartet has preserved their special sound on twelve CD audio recordings and a DVD video since winning the International Championship. Sample cuts from each of the CDs are available to hear at the recordings section of the website. The latest H.E. recording, "Time Flies", was released on the quartet's 40th anniversary on 12/12/12. The new CD contains the ever-popular Old Guys Set in a cappella style, plus four new gospel songs with piano. The Happiness Emporium has recorded four all-gospel albums, Beneath the Cross, Beneath the Cross II, Golden Gospel, and Golden Gospel II. The last two gospel albums feature instrumental accompaniment in a crossover style combining both barbershop and southern gospel. Some call it GospelShop. Some just call it good! In 2000, the quartet took over the Good News gospel quartet program following the retirement of three of the founders; Jerry Fairchild, Joe Mazzone and Dale Deiser. All three of those founders are now deceased. Many new songs and learning CDs were added to the program during those Happiness Emporium/Good News years. On July 1, 2014, the Good News program and all legal rights to Good News products were sold and transferred to the Barbershop Harmony Society. Good News products will continue to be offered through BHS worldwide distribution and the Harmony Marketplace. Happiness Emporium products continue to be sold on the H.E. website, and bookings are being accepted on a limited schedule basis. You may contact the Happiness Emporium at 4110 Lorene Drive #303, Estero, FL 33928 or by email at rodlead@hotmail.com) or by calling 612-978-8237. The address of their internet website is www.HappinessEmporium.com.